Professional Photoshop Actions For Photographers To Create Endless Possibilities! Do your photos lack the pizzazz to mesmerize your audience? 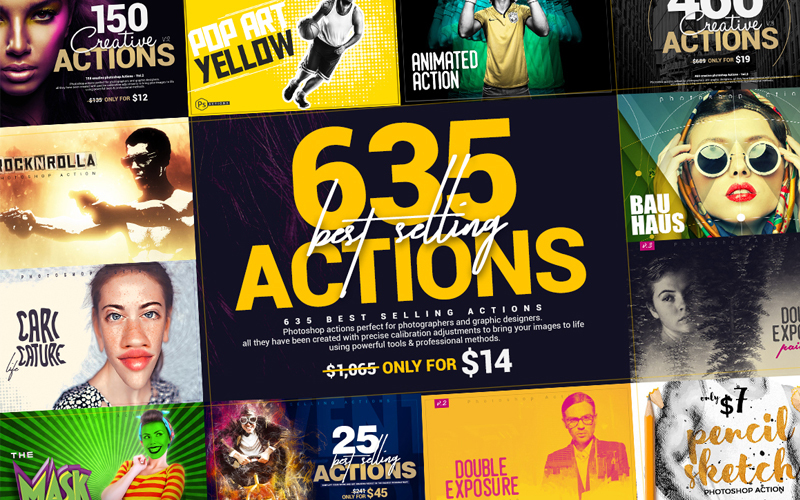 Well, with these 635 best-selling photoshop actions, you can turn any ordinary photo into a professional looking one with just a few clicks. So don’t waste your precious time and energy in manually editing the photos. Just install these photoshop actions and watch them do the magic! Add this bundle of Photoshop effects to your toolbox, and achieve the effects you desire in a flash. How To Install Photoshop Action? Inside Photoshop, go to the ‘Window’ menu and select ‘Actions’. A window will now appear to the right-hand side. Inside the Actions window, click on the top right-hand corner icon to reveal the drop-down menu. From here select ‘Load Actions…’. Select the action which came with the download. The action will now appear in the actions panel. The painting actions only work in Photoshop (English versions) CS6, CC 2017 or later and do not work in Photoshop CS5. The remaining actions have been tested and working on Photoshop (English versions) CS5, CS6, CC+, CC2018. It is highly recommended to work with photos over 1500px to 3000px high/wide for the best results. You must run the action in RGB color mode in Photoshop. The Photoshop Actions require Adobe Photoshop CS5, CS6, CC2018. Reselling, sharing or redistributing is prohibited. Your purchase gives you the right to use this item in a personal or commercial project for yourself or a client, but it cannot be used in a product offered for sale where the item contributes to the core value of the product being sold.